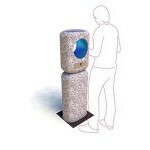 The first of ten new public drinking fountains will be installed in Bath next month. A business-backed community project has also persuaded Sir James Dyson to design a stainless steel drinking bottle for the city. Love Tap Water (LTW) has been launched by three local women in a move aimed at turning the tide against plastic bottled water. LTW has set about to overcome the detrimental effect of plastic bottles on the environment, and the lack of accessible, hygienic drinking water in Bath. The ten modern dispensers will provide free, fresh drinking water, with the next four due to be put in during the summer. All ten will be funded by Alternative Source, a charity set up to raise funds for overseas clean water projects. In return, all of the profits from the sale of LTW stainless steel bottles will be donated to it and other water-based charities. Organisers say “a thorough care regime” will ensure a consistent high quality supply at all times, while their design will discourage direct mouth-to-spout contact. Love Tap Water aim for residents and visitors to be able to drink the same good tap water they drink at home ‘on the go’. As bottled water also costs on average 141 times more than tap water, it is also a cost-effective option for customers. Drinking Water Fountains promote both the health and financial benefits of water fountains, and we look forward to seeing the Love Tap Water project develop into a success for the residents of Bath.